We just wanted to give you some information regarding the upcoming courses that the Parkland ski club will be offering this winter. If you have any questions on these courses or to sign up, please email the contact person. In this course you will see what you should be bringing along with you when you are out on a ski tour as well as a discussion about ski equipment. This is an opportunity to refresh yourself on the use of your transceiver. There will be some discussion, watching certain portions of a video and then you will go outside to actually use the transceivers. Bring your own transceiver if you have one or else use the club ones which will be provided as needed. You will need to be dressed to be outside for a while. In this course, you will learn how to use a map and compass to navigate as well as how to use a GPS to compliment them. In this course, the Saturday will be a classroom day where you will go over some of the theory. On Sunday, you will head out into the field to practice using your transceiver, shovel and probe. You will need to be prepared to be outside for the whole day on Sunday. Use of the club equipment as needed is included in the price. PLEASE NOTE: IF YOU ARE PLANNING ON PARTICIPATING IN ANY OF THE CLUB TRIPS THAT GO INTO AVALANCHE TERRAIN, YOU NEED TO HAVE A MINIMUM OF THE COMPANION RESCUE COURSE AND WE STRONGLY ENCOURAGE YOU TO TAKE THE AST 1 COURSE. Also wanted to let you know about the week long ski trip the club is offering this year. It will be into Talus Lodge. We will meet in Canmore at the ACC clubhouse and stay at the bell cabin for the night of Thursday, March 6th. We will then helicoptor into the lodge on Friday March 7th from either Canmore or Shark Mountain. We will stay for 7 nights at Talus Lodge and then helicoptor out on Friday, March 14th. The cost for this trip will be $1200 per person which includes 8 nights accommodation and helicoptor flights. There will be a planning meeting closer to the date to discuss food, carpooling etc. Please check out the Talus website at www.taluslodge.com. There are only 4 spots left on this trip so contact Kelly at rkbogle@telusplanet.net if you are interested in participating. This course is for those of you interested in helping out at the Bob Johnstone Loppet and Alberta Cup 5 and 6 that will be held in Red Deer on the weekend of January 25 and 26, 2014. This is especially important for those of you interested in timing and being a race official. You will learn about the different types of ski races and what regulations govern them such as distance, elevation changes etc. for the various age groups. This entry was posted in Central Alberta, Club News, Gear, Red Deer, Training on 2013/10/30 by parkland. With the start of the season it is time to go check your gear and make sure that everything is ready to go when the snow flies. 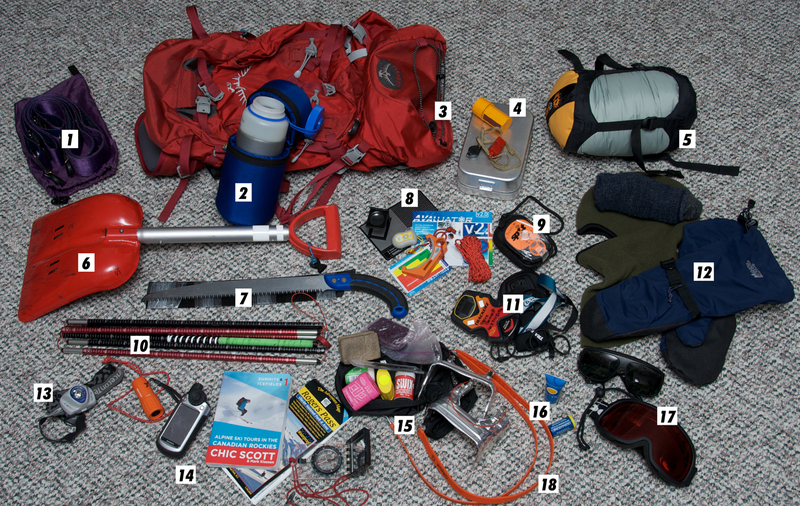 The following is a list of items that I will usually take on a back country, mid-winter, day tour. The list may change a bit depending on the tour and the season but this will give you some idea of what goes into my 30 – 40 liter pack (1). The first thing that I load up on is knowledge and training. This may involve a refresher first aid and avalanche course and checking the avalanche forecast before heading out. The knowledge to use the items you pack. Most of this kit fits in an aluminum box that can be used as a pot to melt snow. We will try to do a future article on what goes into a First Aid/Survival/Repair Kit. **Camera so you can send in your spectacular photos for the newsletter and website. I have probably forgotten something on my list so let us know what you like to have in your pack? This entry was posted in Gear and tagged Backcountry Skiing, Cross-country Skiing, XC Skiing on 2012/11/01 by parkland.